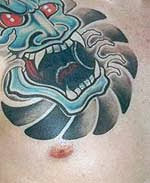 Tebori tattoos contain rich, multi-layered pieces of art, with each aspect contributing to the whole design. the fading of black work used to graduate shading in traditional, often used in clouds and sword swipes. sometimes referring to tattooing near the armpits, on the inside of the thigh or in the private or "secret" places on the body, also the hiding of words in the petals of flowers. fine lines, such as, but not limited to, hair. secondary images in order to support the other image. when an artist tattoos a traditional character in Tebori that was tattooed, the tattoos of that character must be correctly portrayed in the received tattoo. to tattoo only the main image without the support of keshow-bori.